The Kelly Barnes Dam, located above the Toccoa Falls Bible College near Toccoa, Georgia, failed in the early morning hours of November 6, 1977. Thirty-nine people died in the resulting flood, which inundated part of the campus including a trailer park. These Web pages make available two historical reports on the flood and an album of photos of the disaster. The book Dam Break in Georgia: Sadness and Joy at Toccoa Falls by K. Neill Foster with Eric Mills (1978, Horizon House Publishers, 159 p.) tells the stories of many of the flood victims. The Kelly Barnes Dam failed about 1:30 a.m., on November 6, 1977. The dam went through various stages of development. First as a rock crib dam and then with subsequent stages as an earth dam. The rock crib dam was completed about 1899 to back up water which would be used to power a small hydroelectric plant located near the foot of the Falls. About 1937, the Toccoa Falls Bible Institute was interested in developing a more dependable power source and decided to build an earth dam over the rock crib dam. This construction was performed with equipment provided by a local manufacturer. After World War II, the earth fill was raised to a point where an earth spillway on the left side of the valley could be utilized, and a low point on the rim on the right side away from the dam would serve as an secondary spillway in case high flows occurred. The final height of the dam was approximately 42 feet above the rock foundation. This installation served as a power source until 1957 for the Toccoa Falls Bible Institute, which later became the Toccoa Falls College. At this time, the development of power was stopped but the dam continued to be used as a recreation lake. The Board could not determine a sole cause of the November 6, failure. It does conclude that a combination of factors caused the failure. The most probable causes are a local slide on the steep downstream slope probably associated with piping, an attendant localized breach in the crest followed by progressive erosion, saturation of the downstream embankment, and subsequently a total collapse of the structure. On Sunday, November 6, 1977, at approximately 1:30 a.m., the Kelly Barnes Dam near Toccoa in Stephens County, Georgia, failed during a period of intensive rains. The resulting flood took 39 lives and did extensive damage to the Toccoa area and especially to the campus of the Toccoa Falls College. "To authorize the Corps to provide necessary assistance over the next month or six weeks that will make possible a technical assessment of the Kelly Barnes Dam failure. Please do not hesitate to seek the assistance of other Federal agencies having useful expertise in this problem." The purpose of this report is to present the results of a Federal investigation into the failure of the Kelly Barnes Dam aimed at determining the probable cause(s) of failure. At the request of Governor Busbee, the Board restricted its attention to determining the probable cause(s) of failure of the dam and the technical details relating to the failure. Therefore, no attempt was made to assess downstream damage or to determine liability for the failure. The Board recognized that it might be virtually impossible to determine the exact cause of failure because the failure removed a major portion of the dam and masonry structures. Also, the age of the dam, the lack of design, construction, and maintenance records, further handicapped the investigation. The Board elected to examine all possibilities and then to offer its judgement as to the most likely occurrence. Detailed measurements, sketches, and plane table surveys. Core drilling for soil samples. Review of old records, including newspapers. Personal interviews with individuals having knowledge of the dam or its history. Public meeting to solicit information about the dam and conditions or incidents that may be related to its failure. Studies of old maps and photographs. Excavation of remaining portions of the dam. The Board was able to piece together a general picture of the dam prior to failure. The Kelly Barnes Lake was located near Toccoa, Georgia (Exhibit 2). The dam was approximately 400 feet long with a crest width of approximately 20 feet and about 38 feet high at its maximum section. The dam was concave upstream filling a narrow portion of the gorge formed by Toccoa Creek. The dam impounded a lake at normal pool elevation of approximately 40 acres. The dam and surrounding areas were covered by a heavy growth of bushes and trees. On the left abutment (looking downstream) an earth spillway (main earth spillway) had been excavated to the left of the dam. This spillway apparently carried all normal flow of water around the dam. Two masonry intake structures had been constructed on the left central upstream face of the dam and were partially or totally obscurred from view by the brush and trees. On the right rim (looking downstream) a low area in the approach road acted as a secondary earth spillway. The slopes of the dam, approximately one vertical (1V) on one horizontal (1H) were steep compared to today's standards. A slide on the downstream slope had occurred in this area and had not been repaired. Immediately after the Federal Investigative Board was formed on November 8, 1977, efforts were undertaken to obtain maximum public involvement. On November 10, a news release announced formation of the Board and solicited old photographs and first-hand knowledge about the dam and its construction history. On November 14, a second news release was issued by the Board setting up a two-day public meeting at the Georgia Baptist Assembly on November 17-18 in an effort to encourage local people to provide any first-hand knowledge about the incidents leading up to the failure, copies of old photos, details about earlier construction features of the dam, observations on visits to the dam site, or any other knowledge which may provide a broad-based background. Copies of a public notice were sent by mail to every household and business firm in Toccoa and Toccoa Falls. Attendance at the public meeting was sparse, except for news media, and limited information was produced by the public meeting. Interviews were conducted by the Investigative Board following the public meeting with a number of local citizens who indicated various degrees of knowledge about the structure. Telephone interviews were conducted with people as far away as California and Texas in an effort to locate historical data about the dam. 1. In 1899 a rock crib dam, constructed by Mr. E. P. Simpson, was completed at the present dam site. This dam furnished water to a small power plant known as the Toccoa Falls Light and Power Company (Photo 1). This plant is still located on what is now the Toccoa Falls College campus. Water for the power plant was delivered from the dam through a spiral riveted pipe (penstock) approximately 30-inches in diameter. 2. In the early 1930's, Mr. Kelly Barnes, then the Business Manager for Toccoa Falls Institute (forerunner of the Toccoa Falls College), acquired the land for the school which included the E. P. Simpson Power Dam and another dam further upstream. An inspection of the upstream dam during the investigation revealed that it had been inoperative for a number of years and had no effect on the Kelly Barnes Dam. Records indicate it was destroyed by a runoff event in 1929. An earth fill dam was constructed at the site of the E. P. Simpson Dam in the period of 1939-1940. This earth dam incorporated all, or part of, the old crib dam into its downstream toe. Construction was accomplished using equipment reportedly furnished by the LeTourneau Company of Toccoa, manufacturer of self-powered earth scrapers. Conflicting information has been received, but the machinery apparently was operated by local persons, some of whom may have been students trained at the school. Prior to placing the earth fill, attempts may have been made to remove sediments that had accumulated behind the old crib dam. However, comments by historical witnesses, and evidence visible at the site after the recent failure, indicate that this removal was not extensive or complete. The fill was reportedly placed in layers and rolled by the movement of rubber-tired scrapers and a track-mounted dozer. According to witnesses, a low-level spillway outlet, consisting of a 30-inch metal pipe, was placed through the dam along the streambed with its inlet located on the upstream slope. The exact location, elevation, and configuration of this low-level spillway has not been established. There is also some question as to whether or not the spiral riveted penstock in the vicinity of the dam was replaced during this period. This dam became known as the Kelly Barnes Dam. 3. The March, 1946 issue of the Toccoa Falls News, the school newspaper, carries the story of a dam bursting approximately one mile above the school. This dam, said to be the McNeely Dam by a historical witness, was located on Dead Man's Branch and would not have affected the Kelly Barnes Dam. 4. The June, 1948 issue of the Toccoa Falls News contains a reference to a new dam being constructed about one-half mile above the Falls. This is the location of the Kelly Barnes Dam. It may not have been a new dam but an addition or repair to the existing dam (Photo 2). Photographs were taken by a construction worker who welded the outlet pipes and who was also a student at Toccoa Falls College. These photographs, developed in 1949 (Photo 3) show the crest of the dam as construction progressed with separate inlets for a low-level spillway and a welded steel penstock to the power plant. The low-level spillway had a rectangular shaped masonry inlet which could be shut off with stop logs or flashboards. The inlet for the welded steel penstock was also masonry and controlled with a slide gate at the upstream toe of the dam. The approximate location of these inlets are shown on Figure 1. Some historical witnesses remember the penstock slide gate but do not recall the masonry structure. After the failure, this gate was retrieved from below the dam site and found to be closed. The conduits for the spillway outlet and new penstock were both welded plate pipes approximately 30-inches in diameter. A historical witness stated that during placement of fill over the spillway conduit, the pipe began to cave in and had to be reinforced with metal struts. Descriptions of the earth fill construction and equipment are similar to the construction which occurred in the 1930's (Photo 2). At this time or during previous construction, the old spiral riveted penstock pipe had been abandoned but not removed. Conflicting information suggests the possibility of a series of construction events during the 1940's. 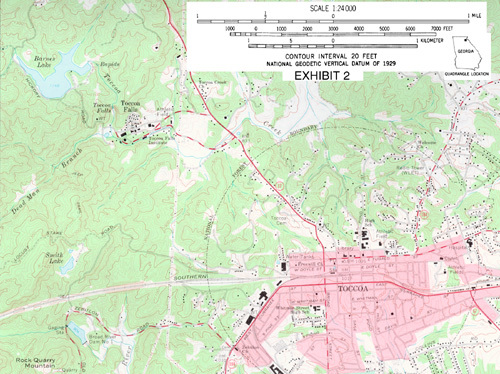 A 1954 Survey of Buildings, Roads, Streams, and Lakes of the Toccoa Falls Institute (Figure 2) locates the overflow pipe (low-level spillway), a 24-inch conduit (welded steel penstock), and the intake structures. 5. Information available indicates that the fill was constructed to its final height in the late forties. However, a study of stereo-pairs of aerial photographs taken on January 17, 1955 shows the reservoir to be essentially empty at that time. The inlet structures, two earth spillways, and the pipe leading to the powerhouse are clearly visible. In later years a heavy growth of vegetation became established on both the upstream and downstream face and apparently obliterated the masonry intakes from view. Again, information received from historical witnesses conflicts as to whether or not two structures existed at the time of failure. Judging from the debris found downstream and the remains of the welded steel penstock, it is the Board's opinion that both existed at the time of failure. 6. A number of observers informed the Board of seeing almost continual seepage on the downstream slope of the dam near the point of exit of the spillway pipe. Photographs obtained from one source taken in 1973 show that a large embankment slide had occurred on the downstream face of the dam (Photos 12 and 13). This 12-foot high, 30-foot wide slide of unknown depth, was observed on the lower one-third of the downstream slope in the area of the current failure section, which was the highest point of the dam. The slide left a two-foot, vertical, scarp face and partially exposed the end of a pipe. The slide, at the time of the photograph, was apparently not recent because of the existance of established vegetation on the slide area. The picture shows the pipe to be essentially clogged with silt and trash, but a very slight seepage was observed coming from the pipe. The area near the pipe contained water that was discolored by iron oxide, sulfur, or some oth er matter indicating little or no flow. The area adjacent to the recent dam failure was wet and spongy a week after the failure and seepage water was still coming from the toe near the right abutment (looking downstream) at that time. 7. In May, 1976, Toccoa Creek flooded below the Falls. Many other small rivers in the region also flooded, doing considerable damage to roads, bridges, and farm lands. The area was declared eligible for Federal Disaster Relief. Federal agencies examined the area and authorized $30,000 for repairs to roads of Toccoa Falls College. There was no reported inspection of the dam at that time. It is likely that the flooding was from local inflow of tributaries below Toccoa Falls as well as from the Toccoa Creek above the dam. 1. General. Site investigations consisted of detailed visual inspections and photographs of the dam site, soil sampling, excavations of portions of the remaining embankment, plane table surveys of the site, and investigation of the debris downstream of the dam by the Board members and data gathering teams composed of personnel from all the Federal agencies involved. Discussion will be divided between investigations at the site and inspections of debris downstream of the dam. 2. Observations at the Dam Site. In order to facilitate site inspections, a plane table survey was conducted and a base line was established. The location of the base line is shown on the plan view (Figure 1). An assumed datum has been used which is 540.46 feet above National Geodetic Vertical Datum (mean sea level). Investigations consisted of detailed visual inspections, measurements, soil sampling, and physical property testing of various materials found at the site. The dam site is located on Toccoa Creek, approximately 2000 feet upstream of Toccoa Falls, on the northwest side of the City of Toccoa, Georgia. The dam crest width varies but the average width is approximately 20 feet. Side slopes vary but near the failure area appear to be about 1V on 1H. Maximum height is approximately 38 feet. The total length of the dam was approximately 400 feet, although only a section about 200 feet long appears to be higher than 20 feet. This is the section in which the failure occurred (Photos 5 and 6). The embankment is a homogeneous earth section in that apparently no selectivity was made of material coming from the borrow pits. The predominant embankment material is residual soil consisting mainly of silts of varying plasticity and some silty sands and clays. The embankment materials are distinguishable from the foundation materials by their reddish and tan colors. There is no evidence of an internal drain or foundation cutoff. Portions of the embankment were constructed across a layer of alluvial material (silt). This layer is clearly visible in the photograph (Photo 9). The remaining embankment slopes are heavily vegetated and trees up to one foot in diameter are common (Photo 10). Near the ends of the dam the vegetation makes it difficult to distinguish between the fill section and natural ground. There exists an uncontrolled earth spillway (main earth spillway) excavated through the hillside beyond the left abutment (Photo 7). The spillway is about 60 feet wide at the entrance but quickly narrows to a base width of approximately 11 feet for the major portion of its length. It is about 380 feet long and has side slopes of about 1V on 1H. The invert appears to vary from about 10 feet below the crest, at the upstream side, to about 20 feet at the discharge area. The spillway area is heavily grown up, predominantly by small trees and brush along the spillway sides. One person interviewed stated that this spillway was constructed in the 1960's. However, aerial photos taken January, 1955, clearly show the spillway. In addition to this spillway, there exists a low spot in the reservoir rim, on the right side, in the vicinity of the "Fort Toccoa" sign that has effectively served as a secondary spillway (Photo 11). There is evidence that water has gone over the rim at this location several times in the recent past including the night of the failure. The crest of the secondary spillway is seven feet below the top of the dam. Debris marks on the upstream face of the dam indicate that there was five feet of freeboard below the earth road at the dam crest prior to failure. The water depth in the main earth spillway was about four feet. There is a report that the fireman who inspected the dam site two to four hours before it failed found no water in the secondary spillway. Another unconfirmed report has the lake level falling. 3. Data Revealed by the Failure. The left side of the breach exhibited tension cracks extending about 30 feet back from the failure scarp. The cracks were perpendicular to the dam axis and decreased in width from the edge of the breach. The face of the breach had a slope of about 1V on 1H (Photo 8). The central portion of the crest of the remaining dam was free of vegetation except for grass. The slopes and outer edges were covered with trees and brush. The brush on the upstream edge of the crest was free of debris. The grass on the crest, extending from the breach back to the spillway, was not knocked down or bent from the vertical. Also noted on the crest was an old campfire site and numerous newspapers, all undisturbed (Photo 5). On the downstream slope of the left embankment, the location of a rotted out tree stump was observed. This had left a vertical hole in the embankment. Also on the downstream side of the left breach, water had washed away the leaves up to about 21 feet above the existing channel. The after-failure survey indicates the high-water marks. The left bank water mark is about 14 feet higher than the high-water mark on the right side of the channel. These marks are indicated on the site topographic plan (Figure 3, 156k). Some old rock and rubble were noted on the downstream toe of the left breach. This material looks as if it was placed, rather than being a natural deposit. Also noted were several logs or timbers, likely the remnants of old cribbing. Spillway inspections indicate the main earth spillway usually carried approximately one foot of water. The fact that water continually flowed over the main earth spillway is supported by staining on the rock at the spillway outlet and statements of historical witnesses. Topsoil and leaves were scoured off of the spillway sides up to about four feet above the bottom of the spillway; however, three to four feet of spillway freeboard apparently remained during the failure. The breach exposed the dam's foundation under both sides of the breach (Photo 5). On the extreme right side, the flood had cut to rock. The erosion of the foundation revealed about four feet of alluvial silt beneath the embankment and overlying the rock (Photo 9). The exposed face (scarp) is practically vertical on the right side (Photo 10). From the left edge of the stream to the toe of the left scarp, the exposed silt layer slopes upward. There appears to be two distinct and different layers of silt beneath the fill. The bottom layer, immediately over the rock, is about two feet thick near the embankment centerline and is a tan plastic silt with some sand. (The tan color may be due to some oxidation). Overlying this layer is about two to three feet (at centerline) of grey fat micaceous silt. At the material interfaces, there are remnants of old root systems. Along the root line, seepage was noted after failure. The impression is that the lower layer was natural material and the grey layer the result of later deposition such as would occur in a reservoir. At least in some locations, the embankment was built across both these layers. The layers are less pronounced near the downstream toe of the embankment. The right side of the breach was considerably steeper than the left. The scarp was practically vertical for a considerable distance and the overall slope is estimated at 1V on 0.5H. As previously observed in the left scarp, a considerable root system is exposed and extended down into the embankment (Photo 10). These roots varied in size up to three inches in diameter and some extended down into the remains of the rock crib dam. No tension cracks were observed on the right embankment crest. The vertical distance from the exposed rock in the streambed to the top of the dam on the right side of the failure is approximately 42 feet. This includes about four feet of silt and 38 feet of fill material. On the downstream exposure of the right breach, there is a flat area similar to a berm. (This is not evident on the left side). This berm appears to be located about half way up the embankment from the toe. An area of rock and rubble is exposed beneath the downstream toe of the right scarp face about 73 feet downstream of base line station 2+60 (Photo 10). The rock has about an 18-inch maximum size. This rubble is similar to the material observed under the left toe except that there is a much larger quantity of material. The area is approximately 12 feet wide at the base and six feet high. The material extends to natural rock. On the upstream side of the material a feature appearing to be a grout filled sandbag was observed. In the vicinity of the rock and rubble, about 78 feet downstream of base line station 2+75, a log about 12 feet long and 18 inches in diameter was found (Photo 10). This log was secured to the underlying rock by a steel pin one-inch in diameter. This log is believed to be a remnant of the old cribbing. Also noted in this area was another steel pin which was sheared off at the top of rock level and appeared to have been abandoned for some time. Other holes, apparently drilled, were observed in the foundation rock. Immediately above and upstream of the rubble area a 30-inch diameter spiral riveted steel pipe was found with its open flange face roughly corresponding to the face of the failure surface (Photo 9). This pipe is about 60 feet downstream of base line station 2+60. The invert of the pipe roughly corresponded to the top of the underlying silt layer. The pipe runs sub-parallel to the dam axis and daylights in the downstream slope where it appears to have been cut off and abandoned. Metalurgical analyses date the pipe as being installed about 1900. The pipe is partially collapsed inside. Also noted was a vertical pipe about four inches in diameter penetrating the 30-inch pipe from the top and protruding about a foot into the larger pipe. The small pipe was plugged at the top. The flanged end of the 30-inch pipe shows no evidence that the pipe was sheared. Rather, it appears the pipe was unbolted at some time in the past and left open. The upper half of the pipe is surrounded by a piece of concrete about a foot or so from the end. This concrete may have been part of a headwall, seepage collar, or other old structure. At the flanged end of the pipe, wood framing and cribbing is exposed. This material was left in place when the earth fill was constructed. Approximately 25 feet upstream from base line station 2+20, remnants of what appears to be a concrete sill were found on and in the face of the embankment. The top of the sill was about 30 feet below the embankment crest. On the top of the sill there were remnants of concrete masonry walls. This sill would have been the base of the welded steel penstock inlet for the pipe to the powerhouse. Excavations into the area of the scarp at the location of the masonry sill, revealed a 30-inch welded steel pipe which had a wall thickness of 3/32-inch. The pipe had a square flange of 1/4-inch thick steel plate. The pipe, later exposed by excavation, was uncoated. About half the flange was torn away from the end of the pipe. The pipe was partially collapsed but inspections indicate that this collapse was not recent. The alignment of the pipe is such that it appears to lead down the mountain to the old Toccoa Falls Power Plant. No evidence of piping or erosion was noted around the pipe. It is important to note that all remaining slopes of the dam were heavily vegetated. Trees in excess of one-foot in diameter are common. The breach surface indicates a significant root system down into the embankment. Observations on the right downstream slope of the dam revealed the 30-inch spiral riveted steel pipe exposed on the downstream toe about 85 feet from its exposure in the breach. The pipe appears to have been cut off and abandoned. The pipe is about 80 percent plugged with soil, but leaves and topsoil were washed away at the mouth of the pipe. It appears that some water went through the pipe for a short period of time during the failure once the end of the pipe was exposed on the scarp. Below the dam there exists remnants of two lines of pipe leading to the Toccoa Falls Power Plant. The older line is spiral riveted steel pipe such as exposed in the right embankment toe at the rubble area. The newer line is at a higher elevation and is welded steel pipe. This newer pipe aligns with the pipe excavated near the concrete sill upstream of the base line. The new line also exhibits an air vent tower and gate valve as shown in Figures 2 and 3. Pieces of metal were found. These included what appeared to be a track, gate wheel, trash grate, metal channel, steel plate, and various pieces of pipe of varying diameters, some being bituminous coated. Large logs and timbers such as had been observed to be bolted to the rock at the site were found. These were about 12-inches to 18-inches in diameter and contained old spikes. Several pieces of concrete masonry were found. In general, these pieces ranged from approximately three to four feet in each direction. They appear to be remnants of an old concrete block wall, perhaps a portion of the outlet structure. One piece was curved as if it had fitted around a pipe. The diameter of the curve was about 30 inches. A steel plate structure was observed which contained remnants of a sliding gate over an outlet pipe. The pipe diameter was about 30 inches. The plate was three sided with dimensions of about three feet by four feet. It appeared to have been some type of liner for a masonry structure due to imprints on the exterior and masonry in the area. In an effort to obtain information relative to the history and condition of the dam prior to failure, samples were obtained of embankment and foundation soils and certain pieces of pipe found in the area. Soil samples were obtained from the site for purposes of testing the materials in order to have an indication of the properties of the dam. Samples of various materials from a number of locations were obtained for classification tests. Two bulk or chunk type undisturbed samples were taken from the two predominant foundation materials. The upper grey silt layer sample was taken from about 38 feet below the crest and about eight feet downstream of base line station 2+26. A sample of the underlying residual foundation soil was obtained from near base line station 2+72, about 40 feet below the embankment crest. Also, undisturbed Shelby tube type samples were obtained from a core boring located at base line station 2+00 on the crest of the right breach. Testing of soil samples was conducted at the Corps of Engineers South Atlantic Division Laboratory, Marietta, Georgia. Testing was conducted in accordance with Corps of Engineers Manual EM 1110-2-1906, Laboratory Soils Testing. Classification and moisture content tests were performed on all materials. Shear tests were performed on the undisturbed samples. Field density and standard compaction tests were performed on certain of the materials from the Shelby tube embankment samples. Pin hole dispersion tests were performed on the grey foundation silt and embankment materials to determine if the material was highly erodable or susceptible to piping. Unconfined and rapid direct shear tests were performed to compare peak and ultimate strengths, as well as strain at peak strength and at failure. Tests indicate the embankment was predominantly composed of fine grained soils which classify as ML, MH, CL, CH, and some SM material, as defined in the Unified Soil Classification System. It is noted that some of the embankment samples have a low plasticity; i.e., plasticity index less than 10. The degree of compaction, indicated by the samples tested, varied from about 78 to 86 percent of Standard Proctor maximum density. These densities, though low, are not inconsistent with what would be expected from construction procedures such as apparently utilized in the dam. The pin hole tests indicated the materials were not dispersive. Shear strengths of the soils appear to be generally good despite the relatively low densities. However, it must be noted that these samples were, of necessity, taken from areas outside the failure zone and must not be regarded as being fully reoresentative of embankment strengths in the area of the failure. Spiral riveted steel penstock pipe with flange was installed in the early 1900's. Pipe from the welded steel penstock to the power plant is dated about 1940. Pipe with bituminous coating was from 10-15 years old. 1. General. No design, plans, or construction cross sections for any of the various stages of construction and/or repair have been discovered. The maximum section of the dam was destroyed by the failure. It can only be presumed that the cross sections of the dam, as seen on the two faces of the breach, continued across the creek. The dam was generally crescent shaped, concave upstream, and apparently followed a low ridge. Though it is impossible to fully reconstruct the dam condition and configuration prior to the failure, the following is considered a reasonable reconstruction of recent conditions in the vicinity of the failure. Figure 4 is a probable configuration based on site inspections, historical data, and old photographs. The embankment in the area of the failure was approximately 38-feet high with a crest width of about 20 feet. The upstream slopes were approximately 1V on 1H and the downstream slopes were about 1V on 1H. The main or newer embankment was constructed over portions of the old rock crib dam, all of which may or may not have remained beneath the downstream toe. There was probably a berm approximately halfway up the downstream slope. Examination of the cross section that remains discloses four feet of different colored soil below the crest. Whether this is part of the 1939 or 1948 additions, or was added by later maintenance, is not known. Therefore, it can be concluded that the dam was built in two to four stages commencing with a rock crib dam in 1899. There were apparently two steel plate lined masonry inlet structures. (Photo 3) One structure, at some point in time, controlled water into a welded steel penstock to the Toccoa Falls Powerhouse and was located on the right side of the embankment with the outlet pipe running sub-parallel to the dam axis. The other structure was essentially a low-level spillway inlet structure and had a pipe extending through the dam in the direction of the old creek bed. These inlet structures and pipe lines are shown on Figures 1 and 2. The embankment slopes were heavily vegetated. There is no evidence of heavy surface erosion. There is no evidence to indicate either structure was functional in recent years. Evidence indicates that the main earth spillway was nearly always in use and the low-level spillway through the dam was blocked or plugged. Photographs taken in 1973 show that the area surrounding the low-level spillway outlet pipe had experienced seepage for a number of years and that a slope failure had developed in the vicinity of the pipe on the downstream face of the dam (Photos 12 and 13). Historical accounts support the photographic evidence of long term seepage in the vicinity of this pipe. 2. Site Geology. The dam site is located in the Piedmont Province. The rock type at the site is a biotite gneiss of the Carolina gneiss series. The bedrock is exposed over the stream channel and in the banks at, and just downstream of, the dam site. The rock exposed at the site is a strong, competent, biotite gneiss with minor, shallow weathering. The primary joint sets include two near vertically dipping sets, one striking N80�E and the other striking generally North-South. Another primary joint set is nearly horizontal. A rather extensive root system has penetrated the near horizontal joint set along the creek bank near the downstream toe of the dam. A layer of soft alluvium, from two to five feet thick, was observed in both faces of the breach of the dam. This material extends from the proximity of the old rock crib dam upstream--an undetermined distance. The layer appears to be quite extensive in the foundation of the earth dam. The lower six inches of the layer of the alluvium contains an extensive root mat. The alluvium appears to be composed principally of soft, plastic clay and/or silt with some layers of fine silty sand. 3. Meteorological Conditions. Before rain began the ground was already wet from heavy rainfall of 3-1/2 to 4-1/2 inches which fell on October 25-26. The rainfall began on Wednesday morning, November 2, and ended by midnight on Saturday, November 5. A strong high pressure area, centered over New England, was bringing Atlantic moisture into Georgia on Wednesday and this produced the rainfall at the beginning of the storm period. Meanwhile, a more important development was taking place in Texas where a strong low pressure area was developing at upper levels in the atmosphere. This intense upper level low was located near Shreveport, Louisiana on Thursday morning, November 3; New Orleans, Louisiana on Friday morning, November 4; Mobile, Alabama on Saturday morning, November 5; and Centreville, Alabama on Sunday, November 6. As this slow-moving upper level storm moved closer to Georgia, more and more moisture was brought in on southerly winds from the Gulf of Mexico. Lifting of the air by the higher terrain of north Georgia accentuated the lifting processes provided by the atmospheric storm patterns. A plentiful supply of moisture, lifting of the air, and a slow-moving storm system are the ingredients of a long, heavy rain event. Rainfall reports are received by the National Weather Service from radio stations WLET and WNEG in Toccoa. Since these stations are located some distance from the drainage area above Kelly Barnes Dam, a rainfall survey was made. Three additional storm total values were obtained as shown on Figure 5. In addition to the storm totals, measurements of rainfall at 11:00 p.m. each night were available from one source while the 24-hour amount from 8:00 a.m., November 5 to 8:00 a.m., November 6 was measured by another local citizen. These measurements, interviews with local residents, radar echoes, and hourly values from nearby recording stations were used in estimating the rainfall distribution for the drainage basins above Kelly Barnes Dam. Although radar echoes indicated that the heaviest rainfall probably occurred between 6:30 p.m. and 7:30 p.m., on November 5, the estimated maximum one-hour value is shown between 6:00 p.m. and 7:00 p.m. since points are plotted on the hour. As indicated on Figure 6, the rainfall was light for the first two days with slightly over one inch falling in the Toccoa area by Friday morning, November 4. Rainfall intensity increased somewhat for the next 24 hours, with a storm total of approximately 2-1/2 inches by 8:00 a.m, Saturday morning, November 5. The storm total increased to approximately 3-1/2 inches by noon on Saturday and then the rainfall was apparently light until about 6:00 p.m., when showers moved into the area. From 6:30 p.m. to 7:30 p.m., radar echoes indicated periods of torrential rainfall with frequent intense lightning and thunder. A small tornado apparently touched down about five miles southeast of Kelly Barnes Dam at approximately 8:00 p.m. The damage to trees was limited to only 100 yards in width and about one-fourth mile in length but the tornado was indicative of the severity of the weather. After 8:00 p.m. the showers were less frequent and had practically ceased by midnight. Estimated basin rainfall for the entire period is about seven inches with almost 3-1/2 inches occurring between 6:00 p.m. and midnight on November 5. Rainfall intensities estimated for this storm are common for the Toccoa area. The estimated maximum one-hour, two-hour, three-hour, six-hour, 12-hour and 24-hour rainfall amounts indicate return periods between two and five years. A heavy rainfall period occurred on May 27-29, 1976 in the Toccoa area. The 12-hour and 24-hour rainfall amounts were larger for that storm than for the November, 1977 rainfall period. However, rainfall amounts for six-hour and shorter durations appeared to be heavier in the November 1977 storm. 4. Hydrology and Hydraulics. Information regarding the lake capacity, drainage area, inflow and outflow to Kelly Barnes Lake during the period of November 5-6, 1977, was determined from field surveys, topographic maps, interviews with local residents, and engineering computations. Based on this information it is possible to determine, within reasonable limits, the probable inflow hydrograph for a condition assuming the dam had not failed. In addition, certain inferences can be made regarding the dam failure. The drainage basin above Kelly Barnes Dam is heavily wooded with pines and deciduous trees (Photo 4). It is located in the Piedmont Province in northeastern Georgia. Stream slopes are fairly steep, generally exceeding 100 feet per mile. The drainage area of Toccoa Creek at the head of Kelly Barnes Lake is 4.10 square miles, and at the dam site 4.57 square miles. The normal pool level for Kelly Barnes Lake is about 596.5 feet (assumed datum). The crest of the flood of November 5-6, 1977, (a 5- to 10-year flood) reached a level in the lake of approximately 601 feet which is about five feet below the top of the dam. A hypothetical 100-year flood, assuming no storage attenuation, would cause a maximum lake level of about 604 feet which is about two feet below the top of the dam. The storage attenuation would reduce this level. The capacity of Kelly Barnes Lake was determined from a topographic map made by plane table survey November 25, 1977. At a level of about 596.5 feet, slightly higher than the main earth spillway, the lake contained approximately 410 acre feet of water with a surface area of about 40 acres. At a level of about 599 feet, equal to the elevation of the secondary spillway, the lake contained approximately 540 acre feet. At the highest level reached on the night of the dam failure, approximately 601 feet, the lake contained approximately 630 acre feet of water. The peak discharge of Toccoa Creek, at the head of Kelly Barnes Lake, for the flood of November 5, 1977, was determined from a field survey of cross sections, high-water profiles, and channel roughness coefficients. The discharge was computed to be approximately 840 cfs (cubic feet per second). Based on a regional flood-frequency analysis for small drainage basins, the average return period of this flood is estimated to be five to ten years. Additional computations were made using unit-hydrograph techniques to fit a hydrograph to the computed peak discharge. An estimated inflow hydrograph to Kelly Barnes Lake was derived by making appropriate adjustments for the additional intervening drainage area. The relationship of the lake level to outflow discharge for the main earth spillway and the secondary spillway were defined from field surveys and hydraulic computations. The two relationships were combined to provide a composite (total) outflow rating. This rating indicates that at lake level equal to the maximum height reached on the night of the failure, the two spillways discharged a total of about 400 cfs. Streamflow and reservoir routing techniques were used to estimate the probable lake-level hydrograph, the lake-outflow hydrograph, and the stream-flow hydrograph just below Dead Man's Branch in the Toccoa Falls College area for the night of the dam failure. The computations are based on the assumption that the dam did not fail, so that the probable normal situation could be depicted. The stream-flow hydrograph just below Dead Man's Branch was computed because testimony of local residents provided information which could be used to roughly verify the computations. Based on these computations, the lake began a significant rise at about 6:00 p.m. to 7:00 p.m. on November 5. Outflow at the time was limited to the main earth spillway of about 50 cfs. At about 8:00 p.m. to 9:00 p.m. the lake reached a level so that outflow began through the secondary spillway. Total computed outflow at this time was about 120 cfs. Had the dam not failed, the lake would have risen to a level of about 601.5 feet and would then have started a slow decline after about 11:00 p.m. on November 5. The maximum outflow through the two spillways would have been about 500 cfs. It would have taken at least six hours following the crest for the lake to recede to a level below the level of the secondary spillway, assuming the dam had not failed. The streamflow hydrograph computed for Toccoa Creek just below Dead Man's Branch indicates a peak discharge occurring at about 9:30 p.m. November 5. The timing is supported by testimony of local residents who state that the creek overtopped a bridge in the vicinity at about 9:00 to 10:00 p.m., and then began to recede. After this time, local residents state the stream was "up and down" several times. No information is available to support the computation of peak discharge; however, the good agreement of timing indicates the hydrograph computations are reasonable. The actual maximum level reached by the lake was 601.1 feet based on field surveys of high-water marks. This is only about a half a foot different than the computed elevation, and is well within the range of error to be expected in such computations. The computed time at which the lake level rose above the secondary spillway is significant. It is highly probable that the water would be flowing through this spillway after 8:00 or 9:00 p.m. on November 5, and throughout the remainder of that night and the early morning hours of November 6. However, a local volunteer fireman has stated that he and another person went to the dam at about 10:00 or 10:30 p.m. and crossed the secondary spillway. He said there was no water in the spillway and the lake level was "not even close" to the secondary spillway. Newspaper accounts say the men went to the dam two hours prior to the break, or about 11:30 p.m. In either case, the lake level should have been over the secondary spillway. Considering this in light of the hydrograph computations, it would imply that outflow, in addition to that carried by the two spillways, occurred to cause the lake to recede from a crest at about 601 feet, and to a level below the secondary spillway before the men went to the dam. This would suggest a partial failure of the dam several hours prior to the main failure. Additional support for this conclusion is that field observations of bent grass in the lake bed indicate little or no velocity occurred between the maximum lake level of 601.1 feet and about 597 feet. Below a level of 597 feet, a definite pattern of high velocity was noted, indicating a large amount of flow occurred in the lake in a short time span after the lake receded to that level. A portion of this drawdown could have occurred after the main failure began. Furthermore, the statements regarding the "up and down" nature of the stream in the college area after about 9:00 p.m. suggests something unusual happened before the main break. The major failure of Kelly Barnes Dam occurred at about 1:30 a.m. November 6, 1977. At that time a surge of water was released from the lake. Field surveys of cross sections, high-water profiles, and roughness coefficients were used to compute a peak discharge of 24,000 cfs in the channel at a site about 800 to 1000 feet downstream from the dam. 5. Stability Analysis. A steady seepage stability analysis, utilizing unconsolidated-undrained tests performed on undisturbed samples, was performed for the downstream slope of the dam. For the analysis, the phreatic line was assumed to exit at a point approximately one-half way up the downstream slope. The cross section used included the estimated 12 foot by 20 foot slope failure section shown by the 1973 photos of the downstream slope. The other assumed slopes are based on observations of the remaining slopes, topo map, and reports of witnesses. The sliding circle method of analysis was used. The stability of the assumed embankment section with the stated conditions is marginal as indicated by a factor of safety of 1.02. While it is not possible to conclude the specific cause(s) of the dam failure, the investigations and available evidence support the development of certain probable failure hypotheses and at the same time throw out consideration of some possible modes of failure. Information received and records available indicate that the dam and/or spillways were modified, repaired, and/or extended over the years. Some witnesses referred to previous spillway and/or dam failure. These activities and the causes leading to them could not be specifically documented. However, documentation shows there was construction about 1939-1940. Additional construction or repair occurred about 1948-1949. The reservoir was essentially empty in January 1955 for some unknown reason. Reports were received that sandbags were used in the past to prevent overtopping of the crest. The crest elevation at that time is not known. A responsible source reported that the main earth spillway on the left abutment was constructed in 1965-1967 and sandbagging was not needed thereafter. This may have been an enlargement of the spillway since the 1955 aerial photos show a left abutment spillway. The 1949 and 1955 photos and the 1954 survey plot show two upstream inlet structures. Information from fishermen and visitors with recent knowledge of the dam and lake refer to only one structure. The conditions of these structures at the time of failure is undetermined. The Board addressed its attention to any possibilities of failure and circumstances that could have contributed to the failure. These possibilities are addressed individually below. Tornado. Severe storms occurred in the area including a small tornado the night of the failure, but the possibility of a twister in the area of the dam which could have caused trees to fall and open the fill to failure appears very remote. Inspections of trees in the vicinity of the dam indicated no tornado effects. Animal burrows. No evidence was found in the remaining sections of the dam to indicate that animal burrows contributed to the failure. Lightning. Although severe electrical activity apparently occurred prior to the time of failure, there is no evidence to indicate that lightning caused any structural damage. Earthquake. A check with earthquake monitoring sources at the Georgia Institute of Technology, the University of South Carolina, and the National Earthquake Center in Denver indicates that the only disturbance in the Toccoa area was limited to thunderstorms. Sabotage. There was no evidence of sabotage. Overtopping. Site inspections and measurements of the high-water marks in the reservoir and the crest of the dam indicate that overtopping did not cause the initial dam failure. Dispersive soil. Laboratory tests on foundation and embankment soils show that these materials are not dispersive clays, and did not cause the failure. Liquefaction. Laboratory tests indicate that the materials, while having a low density, have sufficient cohesive strength and plasticity so that liquefaction was not a cause of failure. The following mechanisms, conditions, failure modes, other than those above, were examined more extensively because of their more likely being factors contributing to the failure. Piping. Piping through the embankment, and the subsequent removal of material from the embankment in the vicinity of the low-level spillway pipe, is a possible cause. If not the actual cause, it may have been a contributory factor. In addition, seepage in the area of the old root mat may have caused piping that contributed to the failure. Structural collapse of Intake. Structural collapse of the low-level spillway intake structure, flashboards, and/or other parts of the structure would allow water to flow under full head into the partially collapsed and blocked pipe. This could have caused an opening of the pipe at a joint or weak spot resulting in further slope destruction on the downstream face. Slope failure. This appears to be a distinct possibility, particularly on the downstream slope when the previous slope failure is considered along with the possibility of the development of tension cracks upslope of the previous failure together with a computed factor of safety that is marginal. The long period of rain would have saturated tension cracks, if they existed, and the entire downstream slope would have become essentially saturated and even more susceptible to failure. A local downstream slope failure similar to that observed in 1973 could have caused limited breaching allowing localized overtopping. This concept would corroborate the hydraulic computations. Seepage. A local slide would have foreshortened the seepage paths and could have resulted in rapid erosion, and/or piping, or both. Local Failure/Pipe Rupture. Since the outlet pipe was observed in the slide area in the 1973 photo, an additional similar slide could have further damaged the pipe sufficiently to cause internal piping and/or erosion that subsequently resulted in a collapse of the embankment. This concept would also corroborate the hydraulic computations. Dam Condition. The dam was in generally poor condition. It can be concluded that in the vicinity of the breach, the dam was heavily vegetated and root systems extended deep into the embankment. The embankment slopes were steep. A pipe from a low-level spillway penetrated the dam in the downstream direction. In the vicinity of the pipe the embankment had experienced a local slope failure and seepage for some period of time. This pipe was reported to have collapsed during construction and to have been repaired at that time. The welded steel penstock pipe, exposed by excavation after the dam failure, had previously collapsed, ripped, been repaired, and apparently partially collapsed again. Other contributory factors that cannot be disregarded was a design, or lack of same, that included a rock crib dam within the earth embankment, together with several feet of lake sediment and old roots, open ended spiral riveted pipe in the earth embankment, a concentration of three pipes in a localized area, pipes through the dam that were not permanently and/or only partially plugged, and a lack of repair of local slope failures. The Board could not determine a sole cause of failure. It does conclude that a combination of factors caused the failure. The most probable causes are a local slide on the steep downstream slope, probably associated with piping and/or an attendant localized breach in the crest followed by progressive erosion, saturation of the downstream embankment, and subsequently a total collapse of the structure. A surface or mass provided to withstand thrust such as at the ends of a dam. A volumetric measure of water equivalent to one acre covered to a uniform depth of one foot. Pertaining to or composed of alluvium, or deposited by a stream or running water. A general term for clay, silt, sand, or gravel or similar material deposited during comparatively recent geologic time by a stream or other body of running water. A reference line used for measurements and surveys. Rock of relatively great thickness and extent in its native environment. A horizontal shelf or ledge built into an embankment or other sloping surface. A metamorphic rock of coarse grain size, in which biotite is a predominant mineral. A tarry hydrocarbon substance sometimes used to coat metals to prevent oxidation. An area from which earth is taken to be used in the construction of an embankment. An opening made by breaking down a portion of a solid body, such as a dike or embankment. A fine grained, natural, earthy material composed primarily of hydrous aluminum silicates. Tests carried out to determine the relationship between unit weight and water content of a soil. A pipe, tube, or tile through which water or other fluid passes or is conveyed. The process of obtaining natural or undisturbed samples of soil or rock by drilling. A point, line, or surface with reference to which elevations are measured. The angle at which a bed, stratum, or vein is inclined from the horizontal. The rate of flow of water in a stream, conduit, or other channel, usually measured in cubic feet per second (cfs). A dispersive soil is a clay soil that behaves as a single grain soil and is highly erodable when subjected to water forces. The area of a drainage basin, or catchment area. A dam built of gravel, earth, broken rock, sand, or silt, and usually containing an impervious clay core or facing. A structure, usually of earth or gravel, constructed above the natural ground surface and designed to hold back water. The ratio allowed for in design, between the ultimate breaking strength of a material, to the force exerted against it. A factor of safety of one means a material will fail when the force exerted against it equals the ultimate breaking strength of the material. Tests carried out under site conditions to determine the density of soils. A wall, collar, or other structure intended to reduce percolation of water along otherwise smooth surfaces or porous strata. The vertical distance between water level and the crest of a dam or the top of a channel. A cementitious material of high water content, fluid enough to be poured or injected into spaces and thereby fill or seal them. A wash line, seed line, mud line, trash line, or other debris line formed at the highest level reached by a stream or body of water. A graph to show the relation with time of the level, flow, or velocity of water in a lake or stream. A means of draining water from the interior of an embankment to prevent water from entering the soil and causing it to soften and endanger the embankment. The bottom, or lowest part, of the internal cross section of a conduit or channel. A surface of actual or potential fracture or parting in a rock without displacement. The direction designated as one faces in a downstream direction. The process of becoming liquid; the sudden large decrease of the shearing resistance of a cohesionless soil. An analysis of the physical and mechanical properties of metal. Reference level, equivalent to mean sea level datum, from which elevations are measured. The usual reservoir level during times not affected by drought or flood. Flow of water over the top of a dam or embankment. A closed conduit for supplying water to a water wheel or turbine. Flow of water, usually downward, through small openings in a porous material. The property of a porous rock or soil medium for transmitting a fluid without impairment of the structure of the medium. The upper free-water surface of the zone of seepage. A physiographical area lying along the southern and eastern base of the Appalachian Mountains. Tests to determine dispersive properties of soils. Erosion by percolating water in a soil resulting in caving and the formation of conduits, tunnels, or pipes through the soil. A method of surveying whereby the observations are plotted as the survey progresses. Used extensively in topographic surveys. In soil mechanics, a term used to define soils, usually clays, that are capable of deforming plastically at varying water contents. A method developed by R. R. Proctor for measuring the degree of compaction of a soil. The average period of time occurring between events. A dam constructed of interlocking sections of timber or concrete, forming cells which are filled with earth or broken rock. A computation technique whereby a streamflow hydrograph for a specific site can be transposed to another site. That portion of rainfall that finds its way into streams as surface flow. An escarpment, cliff, or steep slope along the margin of a plateau, terrace, or bench. Solid material settled from suspension in a liquid. The act or process involving the slow movement of water or other fluid through a porous material such as soil or rock. A wall, collar, or other structure to reduce or prevent seepage of water along the outside surface of a conduit or pipe. Tests to determine the shear strength of soils. A soil sampling device consisting of thin-wall tubing which is driven into a soil to obtain a sample. A horizontal structural member forming the bottom of a door, opening, or other entranceway, such as to a conduit or penstock. A fine grained sediment having a particle size intermediate between that of fine sand and clay. A method of analysis that allows the determination of the relative stability of a soil mass. The downward and outward movement of a mass of rock or unconsolidated materials as a unit. A passage for surplus water over, around, or through a dam or similar construction. A log, plank, cut timber, or steel or concrete slab or beam fitted into end guides between walls or piers to close an opening to the passage of water. A decrease in intensity or level of a flood wave as a result of water being stored in the channel or reservoir. The direction or bearing of a horizontal line in the plane of an inclined stratum, joint, fault, or other structural plane. It is perpendicular to the direction of dip. Nearly, but not exactly, parallel. A fracture that is the result of stresses that tend to pull material apart. The base of an embankment, bank, bench, or slope. A map designed to portray an area to a certain scale, and that primarily depicts the relief of the area. A hydrograph of streamflow representing the flow resulting from one inch of rainfall excess occurring uniformly over a drainage basin in unit time. An opening in a rock or soil not occupied by solid matter.